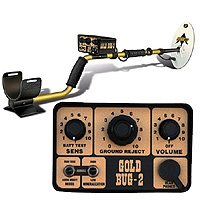 I have owned and used all the Goldmasters, own a Mxt, and gpx 4000, the Gold Bug 2 which I currently own is king of the hill for small gold near the surface with the 6" coil, hands down. Granted its a lot of work manually ground balancing in hot soils but you get used to it and it becomes second nature as you walk along, keeping the machine in tune ready for the next nugget. Would you recommend this to a new user? No, not really. The iron discrimination on the Gold Bug 2 is supposed to eliminate iron even when placed next to a gold nugget. Some Gold Bugs don't discriminate properly and Fisher repair can correct this problem. Takes patience and practice to slow sweep properly and keep it ground balanced. Run it slightly hot (positive feedback) and take your time. I generally use the Whites GMT with larger coil to locate a patch in open ground and then work the patch with the Gold Bug II. I'll also go back with the GB II afterward in many situations if I know there's more small gold there. My personal preference is for two machines in case you have a problem with one of them and are remotely located. Either of these machines will do the trick but like most gold specific machines one will compliment the other. These are my two best machines for the money. I've owned the MXT with all three coils and the GB Pro with the small 5" coil, in the end these two are my go to nugget shooters and will always be pending a future break-through in the technology. Manual ground balancing doesn't bother me. I prefer it. And, you do not have 're-balance with every swing'. This just isn't true. I go out almost every day, in the AZ deserts and yes, you have to recheck from time to time. But, if you see a 'change' in the rock/ground formations, expect to re-balance. Keep in mind that, lacking visual readouts, auto-balancing, etc, the GB2 is the lowest frequency MD available, at 71khz. I hit on 4 thumb-sized rocks today, took them home, and after closer examination, they actually had tiny pieces/specs of gold in them! (Needed a pretty powerful magnifier to see it.) This is why the detector hit on them. I've never seen gold so small But, this is exactly why the GB2 is what it is. The Gold Bug II is an advanced machine in a simple package. Not for the beginner, unless the beginner is willing to take a lot of time learning the setup and the sounds it makes on gold. As to discriminate, the good detectorists dig everything, as gold has been found next to nails, bullets, etc. Be sure to use good-quality stereo headphones. If one puts forth the effort to do the learning, this machine will reward them better than most, by far. Get a friend to bury a small piece of gold or silver in your yard, at different depths, and practice finding it. Learn, learn, learn. This is the K.I.S.S. [KEEP IT SIMPLE STUPID] of gold -detectors = The steak and potatoes- no bling just a work horse -picks up the smallest gold-its light -its tough -if used with quality head phones like the ones minelab recommends with there top model =amazing- thousands of people can't be wrong ! For gold prospecting, after using MD's and doing a lot of research we decided to do a test with tiny, small, and little nuggets, pin head size being tiny. Initially I used an mxt, which is an excellent detector, probably one of the best in it's price range for jewelry, coins, relics, and gold...ie all around, but I hunt for gold and am not a rich man so I wanted the most performance for my buck. A couple of my friends were grabbing smaller and deeper pieces I walked over. Being disappointed I wanted a specialised gold MD because that's what I primarily do. The gold targets were buried at about 3, 6, and 10 inches, three times each with the different sizes at the different depths. The findings cemented my purchase. The best unit with all the finds was the fisher goldbug2, then the GMT, the lobo, the mxt, eureka and stinger were about the same, good but not excellent. Done in northwestern AZ with many hot rocks and mineralization. Hit the iron disc on the GB2 and boom, the hot rock signal disappears 90% of the time, no digging. If it's a nug still a sharp signal...ground balancing is easy and gives excellent discrimination also...most important thing is know your machine, study the controls and it's awesome...only drawback I saw is compared to the whites the control housing is'nt as sturdy/durable, but the high impact plastic is lighter. Slowly slowly , catchy monkey. Not had it for long & still working out the bugs (no pun intended). Bought second hand from a detector shop with warranty for a great price(was shop owners personal detector). Have found discriminate works to a degree. Small iron is canceled out but if its a big bit of iron or close to the surface it still tells you to dig. Found nothing yet but thats not the detectors fault, I am taking it to the beach next even though thats not what it's designed for. Will tell all about how it goes. I've used this now for 8 years, and am changing to a Minelab GPX4500, as I need to work salty soil. I've pulled out nuggets to 7 Grm and stuff so small it's difficult to almost see. And this is in Scotland. If only I could get to Ozland !!!!!! Learn and keep at it, you will win. This for me is the bees knees !! !